Lucky us/you! Welcome to our first installment of the Soundproof Survey, where we ask bands coming to DC a few questions. It's quirky, it's new, it's in the experimental phase, and this one is short and sweet. 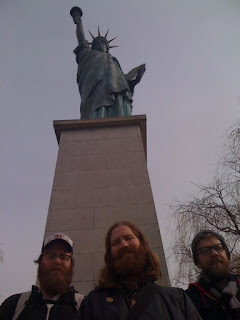 Our guinea pigs are Megafaun, who play Iota on June 8. Formerly of DeYarmond Edison (with indie-stud Justin Vernon, aka Bon Iver), and co-currently of Gayngs (which, like Megafaun, has been featured on here before), the trio hails from Wisconsin by way of North Carolina. Their brand of bluegrass brings banjo and distortion together, keeping it current and country all at the same time. 1. Describe Megafaun's sound in 140 characters. Megafaun is the sound of old friends who grew up together in jazz and now play rock. The first concert I remember was seeing the Beach Boys at the State Fair in Minnesota in the late 80's. Our dad took us. All I remember is they had a rap song thrown in there somewhere! 4. When did music become your full-time gig? We've been lucky enough to to this full time for about 9 months now. 5. What comes first, the music or the lyrics? 6. What can we expect in terms of your forthcoming release(s) and tour? 7. How do you listen to music (ipod, zune, radio, stereo) and how do you get introduced to new music? Touring is usually how we hear new music. Brad keeps up pretty well and we have a lot of time in the car to listen to new things. 8. What trends a) do you see in today's music industry and b) would you like to see in tomorrow's music industry? 9. What do you think of Washington, DC as a music city? So far we've enjoyed playing for DC audiences. They've been attentive but also brought trust and energy. 10. What is your favorite music venue (played or just attended) and why? The Black Cat is really great. Love the food and the staff. Take a listen here and a look there for more about Megafaun. 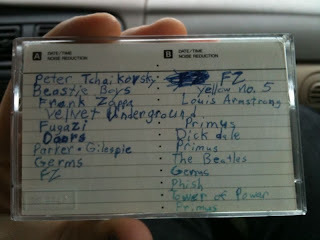 Images from Hometapes' Megafaun blog.